Last week I’d found this article about the Apollo 11 code being on Github, and I took a look beyond what the article mentions. The code on GitHub is written for the Apollo Guidance Computer (AGC) – and Margaret Hamilton, at right, was the Director for the development of that code. 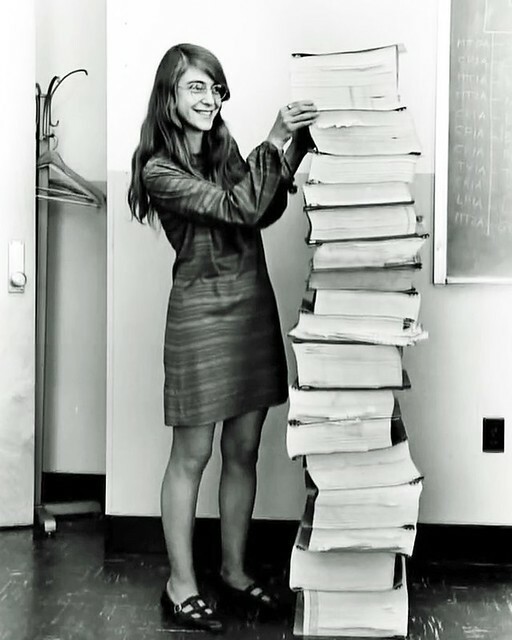 In fact, that’s a stack of the code next to her back in the days when paper was used for development. It was all the buzz for a week or so, and while it was pretty cool to look over the project, particularly the code comments, it interested me more to consider how much interest this project has had – and what projects from my lifetime will be looked back on with the same level of interest. I can’t think of a single one. This is from an era where we aspired to put our feet on the moon, not look around for Pokemon. Can you think of one project that will generate this much interest in 3-4 decades?